The above info came from Who Wants to Know?, and was edited by yours truly (contact me). The image came from MEGADEUS CELS. Mysterious and enigmatic, Angel appears to perform various select tasks for Paradigm: more specifically for its CEO, Alex Rosewater. She takes on many aliases, but she frequently tells Roger to just call her Angel. Roger tends to fire back that she's a fallen angel. Interestingly, Angel has a pair of scars on her back...right where you would think wings would be. Angel is in search of Memories. Originally, she seems in it strictly to sell them for money, but as the series progresses, it turns out she worked for Vera and her Foreigner group, who had a deal with Rosewater until he salvaged the Big-Fau from the Foreign MegaDueces. She quit from Paradigm after that and became a wildcard on no one's side. Due to her feelings for Roger and wanting to know who she is. Even learning her childhood was a sham by Vera, who adopted Angel and told her a poem relating to her scars, and even more her origins. 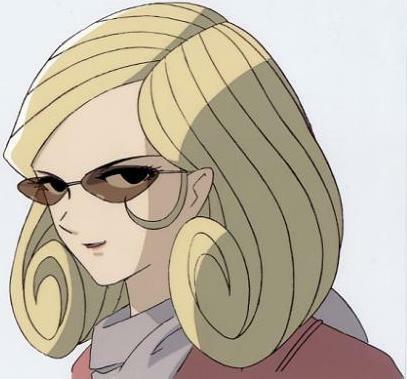 But during the final battle between Big-O and Big-Fau, Gordon Rosewater revealed to Angel her true identity as the "Director of the World", the core of BigVenus, the MegaDuece that caused the memory-wipe 40 years ago. It would have again wiped-out peoples' memories if Roger hadn't negotiated with Angel, who decided to "rewind" back to start of the series, with a few good changes. The above description came from Who Wants to Know? and fractyl2, and was edited by yours truly (contact me). The image came from Anime Adrenaline.